The Vice-President Technical Services and Marketing Programs with Canada Pork International says Canada is positioned to become the number one supplier of chilled pork to Japan in the coming year. 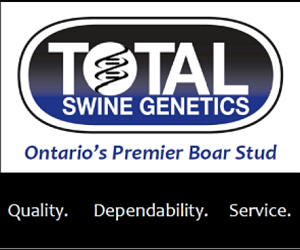 The Canadian pork sector has been focused on producing the kinds of pork global customers are looking for in terms of color, marbling and flavor. Michael Young, the Vice-President Technical Services and Marketing Programs, with Canada Pork International, told those attending the Banff Pork Seminar earlier this month, while the U.S. is by far our largest market by volume, it’s primarily a commodity market where as the most lucrative and the hardest market to satisfy is Japan. Canada has a long history, over 50 years of service for that market, so we’ve done a great job developing our market share. There’s only really three major countries that are able to do high quality chilled to Japan and that is Canada, U.S.A. and Mexico so that is the sector that we focus most of our time and efforts in and it’s very high value, it’s very demanding and it’s and it’s an enviable position for Canada to be in because a lot of exporters are sitting back thinking how can I get into this market. The perception of Canada as a whole has always been good. The Japanese have a long history of buying agri-farm products from Canada so we’ve done a great job of selling our products and they’ve worked with us over the years to refine some of the things we do. Canada, our suppliers work with the Japanese customers to change the specifications, to correct the packaging sizes, to change the meat quality, to select it based on color, to select it based on firmness just for that market. We don’t really do that for any other market on the planet, just Japan. Young says based on last month Canada has 48 percent of the chilled share in Japan and the U.S. has 49 percent but we fully anticipate Canada will become the number one supply partner for Japan in the coming year.